Some people like a more visual method of story telling, and even though graphic novels sometimes get a bad wrap, we think you can gain just as much from these stories as you can from more traditional literature. In fact, graphic novels are incredibly popular in France. You can probably find many of the French classics in graphic form also, but here are some other options if you’re into a more visual form of storytelling. Most of these are relatively new books, so you aren’t going to find free versions online. Instead, check your local library or bookstore. Normandy: A Graphic History of D-Day, The Allied Invasion of Hitler’s Fortress Europe by Wayne Vansant Normandy is a graphic novel that depicts the planning and execution of Operation Overlord in 96 full-color pages. The initial paratrooper assault is shown, as well as the storming of the five D-Day beaches: Utah, Omaha, Gold, Juno, and Sword. But the story does not end there. Once the Allies got ashore, they had to stay ashore. The Germans made every effort to push them back into the sea. The book continues on from D-Day all the way through the liberation of Paris. A great look at military history. The Invention of Hugo Cabret by Brian Selznick Orphan, clock keeper, and thief, Hugo lives in the walls of a busy Paris train station, where his survival depends on secrets and anonymity. But when his world suddenly interlocks with an eccentric, bookish girl and a bitter old man who runs a toy booth in the station, Hugo’s undercover life, and his most precious secret, are put in jeopardy. A cryptic drawing, a treasured notebook, a stolen key, a mechanical man, and a hidden message from Hugo’s dead father form the backbone of this intricate, tender, and spellbinding mystery. Paris Soirees by Philippe Petit-Roulet (Author) and Francois Avril (Artist) This wordless graphic novel was very popular in the 1980s. It tells a dozen or so humorous stories of different people and how they spend a night in Paris. 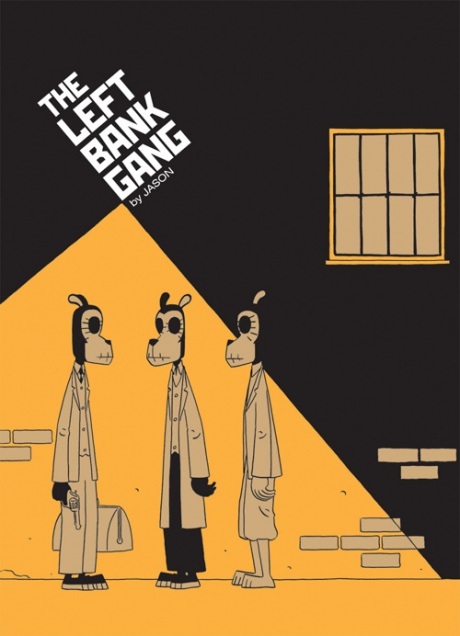 Left Bank Gang by Jason 2007 Eisner Award-winner: set in 1920s Paris, this is a deliciously inventive re-imagining of the great literary figures of the period (Fitzgerald, Hemingway, Pound, and Joyce) as graphic novelists… and perpetrators of a thrilling, double-crossing heist! Set in 1920s Paris, The Left Bank Gang is a deliciously inventive re-imagining of these four literary figures as cartoon graphic novelists! French Milk by Lucy Knisley This book is a series of fun drawings and seemingly random thoughts (with a few photographs thrown in). In it, Knisley, a college student living in Chicago, gives us a look at a six week trip to Paris she took with her mom. They rented a quirky little apartment, shopped local markets for groceries, dined in cafes and restaurants, and saw most of Paris’ famous landmarks. It’s a really good look at what a 22 year old (not that much older than you guys, but a lot older than you guys at the same time) takes away from a month and a half in Paris. I read this one in just over an hour, and I loved Knisley art work, and I thought it was fun to get inside her head and see Paris from her 22 year old perspective – however, she is 22, not 14, so there are some bits and pieces of the book that require a bit of maturity. If you can’t handle that, I’d recommend you find another book to read instead. The Getting to Know the World’s Greatest Artists series by Mike Venezia Cartoonist and biographer, Mike Venezia has created a really cool series of easy to read biographies on some of history’s most famous artists. The books tell the life story of the artists, give examples of their work, talk about their inspiration and style, and give a great overview for readers that don’t come in knowing a lot about art. Venezia’s “Getting to Know the World’s Greatest Artists” series includes books about some of France’s most important artists, including Claude Monet, Paul Cezanne, Pierre-Auguste Renoir, Edgar Degas, Henri Matisse, Paul Gauguin, Georges Seurat, and Henri de Toulouse-Lautrec. I read all of Venezia’s books about Spanish artists before our trip to Spain, and it helped me appreciate and understand the artwork we saw there much better than if I’d gone without doing this tiny bit of research. Asterix the Gaul by Goscinny and Uderzo These are some incredibly popular graphic novels from France. There’s more info about them on the “Modern French Classics” page. The Resistance Series by Carla Jablonski Three graphic novels make up this series of stories from the French Resistance, underground guerilla fighters fighting to save France from German occupation during WWII. The first book is Resistance, in which Paul and Marie’s small French country town is almost untouched by the ravages of WWII, but the siblings still live in the shadow of war. Their father is a Prisoner of War, kept hostage by the Germans. When their friend Henri’s parents disappear and Henri goes into hiding because of his Jewish ancestry, Paul and Marie realize they must take a stand. But how can they convince the French Resistance that even children can help in their fight against injustice? The story continues in Defiance and concludes in Victory. The Louvre Collection is a series of six graphic novels (so) that take a unique look at the Louvre museum, and are some of the very few book co-published by the Louvre museum itself. These books are fantastic, and I doubt many of the local libraries have them. What I would recommend is a group of three or six students purchase them (used if you can find them) as a group and share with one another. Glacial Period by Nicolas De Crécy In this imaginative story, one of the most original and important European comic artists imagines a frozen world thousands of years in the future in which all human history has been forgotten. A small group of archaeologists come upon the Louvre, buried in age-old snow, and cannot begin to explain all of the artifacts they see. On the Odd Hours by Eric Liberge In this story, the author invites us on a guided tour of the museum… by night… when the works of art come alive. Our guide: a deaf night watchman who somehow manages to communicate with the souls of those ethereal and timeless works of art. Rohan at the Louvre Rohan at the Louvre by Hirohiko Araki An original fantasy story about Rohan, a young Japanese manga artist, who is drawing, when he meets a mysterious, beautiful woman who tells him of a cursed 200-year-old painting. The painting was created using the blackest ink ever known, which came from a 1,000-year-old tree that the painter had cut down without the approval of the Emperor. The painter was executed for this, but the painting was saved from destruction by a curator of the Louvre. A decade later, Rohan visits Paris and asks the museum to unearth the painting from deep within its archives—but he is completely unprepared for the power of the curse he has unleashed. The Sky Over the Louvre by Bernard Yslaire and Jean-Claude Carriere This one goes back to the very origins of the Louvre as a museum: the tumultuous years of the French Revolution. It’s the story of a painting of the Supreme Being, ordered by Robespierre from the famous painter David. A painting which was never made. It’s also the story of another painting, that of the young Bara, a 13 year old martyr of the Republic. From the inauguration of the Louvre, former royal palace, as the museum for the people, to the death of Robespierre, this is also the portrayal of the face to face of two major actors of a revolution in a great hurry. Robespierre appears equally enlightened and lost while David accomplishes his destiny: a painter torn between political engagement and artistic ambition. An Enchantment by Christian Durieux Beautifully constructed in a semi-classical style, this graphic novel features a light-spirited romantic story. This latest installment in the Louvre collection tells the tale of a museum director in a waking dream after his retirement dinner where he wanders the vast halls of the museum before eloping with a muse. Phantoms of the Louvre by Enki Bilal The author presents the Louvre as a ghostly place in this series of 22 portraits. The Mona Lisa, the Winged Victory of Samothrace, a reclining Christ, an Egyptian bust—these and other works of art are seen through the eyes of their own particular phantom. The motley collection of men, women, and children presented in these vignettes— a Roman legionary, a muse, a painter, and a German officer, among others—have little in common other than their often violent demises and an eternity spent haunting the iconic Parisian museum. Bilal recounts the life stories of these lost souls in dramatic biographies that combine fiction and historical reality, often evoking the creation of the works in question. Cruising Through the Louvre by David Prudhomme (published in February 2016) The narrator of this story meanders through the Louvre, feeling as if in the panels of a giant comic while he himself is creating his own is this graphic novel. In this institution, all manner of people from all over the world rub elbows quietly. So Prudhomme decides to cruise through the museum, not to look at the world famous art, but to observe the people and their interaction with it. As he wanders, he discovers a group of students somehow stuck together just as in the shipwreck on the Raft of the Medusa; a man standing behind the Seated Scribe, as if attempting to read over his shoulder; and in the hall of antiquities, a woman placing her head in a lion’s mouth.